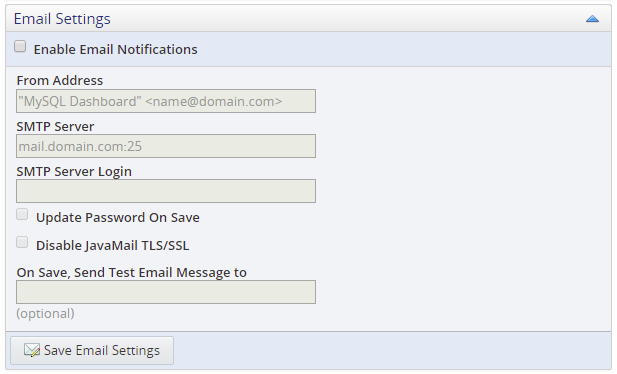 The Email Settings section enables you to define the email configuration, such as SMTP server, username and password to use for all outgoing emails. Select to activate the email settings controls. The email address added to the From field of all emails sent from MySQL Enterprise Monitor. The SMTP server address. The default port is assumed unless otherwise specified. If your mail server does not use the default SMTP port, add the port number to the address using the mailServerName:portNumber format. For example, if your mail server, mail.yourserver.com, uses the port 4456, add mail.yourserver.com:4456 to the SMTP Server field. Select to activate the password fields. Select if the SMTP server does not require an encrypted connection. Enter an email address if you want to send a test email when the changes are saved. Saves the Email Settings and sends a test email if an address is defined in the On Save, Send Test Email Message To field.